A POWERFUL 7.3-magnitude earthquake has sent tremors along the Northern Venezuelan coast. 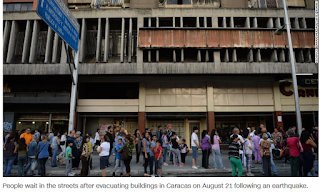 The magnitude 7.3 quake on Tuesday was the largest to strike Venezuela since 1900, the United States Geological Survey (USGS) said. There have been 17 previous magnitude 6 and more earthquakes in this region, large earthquakes are rare. It is the largest historic event within 155 miles (250 km) within this location in the 20th and 21st centuries. The USGS recorded the earthquake in the coastal town of Irapa and tremors were felt 286 miles (622 km) away in the capital of Caracas. Its magnitude was recorded at 7.3 and said it had a depth of 76 miles (123 kilometres). Seismologist Lucy Jones, a research associate with the California Institute of Technology said “shaking does die off at a distance”. She added that the earthquake’s considerable depth likely prevented a tragedy. The quake, which was centred near the town of Guiria caused buildings to be evacuated but there were no injuries. 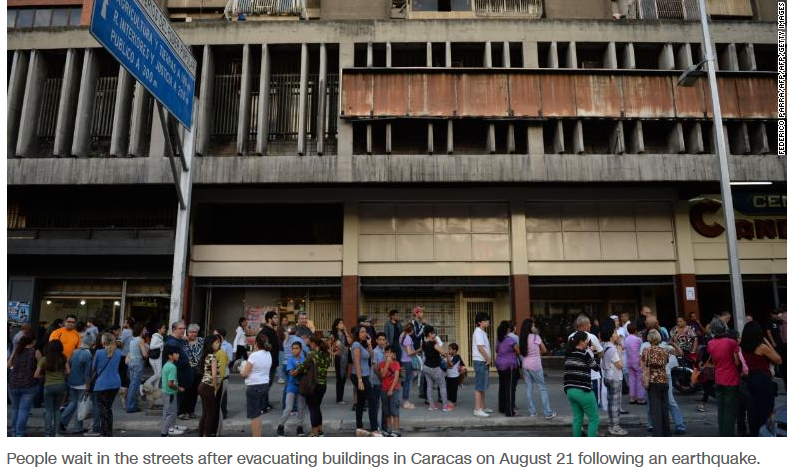 In downtown Caracas, concrete from the top floors of the unfinished Tower of David skyscraper fell onto the pavement, which caused firefighters to close off traffic. The Tower of David began in 1990 as a symbol of the OPEC nation’s ambitions of becoming a regional financial centre. But it was abandoned after the financial crisis and in the past two decades of socialist rule it has become a symbol of urban blight and has been occupied by squatters. The quake’s epicentre was 12 miles (20 kilometres) north-west of Yaguaraparo. In the biggest city near the quake’s centre, Cumana, supermarket shelves came crashing down. The quake was felt as far away as Colombia’s capital of Bogota and authorities briefly closed the international airport to inspect for runway damage. The population of the affected region lives in communities where structures are vulnerable to earthquakes, according to the USGS. A lot of vulnerable buildings are made from unreinforced brick and wood. Experts have long warned that Venezuela’s cash-strapped government is not prepared to deal with a major natural disaster. The country is suffering from inflation estimated by the International Monetary Fund to reach 1million percent this year. Power outages were reported across nearby Trinidad. People ran into the street and gasped as large glass panes at one supermarket shattered and cars smashed as concrete fell down. The quake cracked walls and thousands of goods fell off supermarket shelves. The Pacific Tsunami Warning Center (PTWC) issued an initial tsunami warning for the Venezuelan coast and neighbouring Trinidad and Tobago and Grenada. It later updated its alert, stating: “There is no tsunami threat from this earthquake." However, people near the coast are still asked to remain “observant" and to exercise "caution" near the ocean. The PTWC explained that sea fluctuations "up to 30 cm" above or below normal tide levels may still occur over the course of the next few hours. Footage which emerged on social media following the earthquake showed buildings in Maturin being shaken heavily and people running into the street. In Trinidad and Tobago, phone lines were cut off and there were reports of structural damage to buildings. A witness in Cumana, which is near the epicentre, said there were initial reports of several injuries at a shopping centre after an escalator collapsed. But firefighter captain John Boquett said there are no initial reports of injuries or major damage in the capital. Venezuela’s Interior Minster, Néstor Luis Reverol, wrote on Twitter: “We call on all of the people of Venezuela to remain calm. “We want to inform you that at 5.31 we had a 6.3 magnitude earthquake that was felt in various states of the country including Nueva Esparta, Sucre, Monagas, Bolívar, Delta Amacuro, Aragua, Carabobo and the capital. “So far there have been no reports of any victims." Additional reporting by Alahna Kindred and Martina Bet.